Posted January 26, 2011 by Emmet Farrell in News. 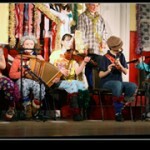 It was no surprise that on the two nights of Leacach CCE Mummers Show that Turloughmore Social Centre was packed to capacity as once again the Mummers Show proved to be a tremendous success. Lackagh Mummers have attracted huge success and attention over the past few years and after their sell out nights, they look forward to the Annual Mummers Festival in New Inn. At the Lackagh Show the underage bands displayed the tremendous work that is being carried out at under age level by Leacach CCE that augurs well to the future of tradition and culture in the area. The Lackagh Senior group once again displayed talent of humour, song and dance and all that is good in the traditions of our country. Geraldine Whelan and Coleman Green took care of the introductions as the underage musical entertainment was under the direction of Gina Loughnane with Eileen Moran and Aoife Burke looking after the under age group. 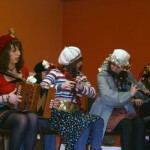 Angela Fahy and Tara Nolan looked after the next age group with Anita Broderick as musical director and Josephine Whelen, Margaret Walsh and Beatrice McGreal taking care of the Mummers group. Please support the Mummers in New Inn this weekend Friday and Saturday 28th and 29th January. Special guests at the Lackagh performance were “Costa Beoga” , the Abbeykmnockmoy Set Dancers who will be part of the All Ireland Talent Show on Sunday and after another wonderful display by the group of which three are from the parish, there is no doubt but it will boost the support for these wonderful talented dancers on Sunday night in the RTE production. Once again, supporters left the venue in awe of such wonderful entertainment that was all home produced. Well done to the organisers and the people that put in so much time in helping and promoting young people to continue the great work that was started by Joe Collins in the area forty years earlier. Many tributes were paid to Joe Collins who was present for the Mummers Show after his recent illness and all wished him a speedy recovery to full health. The organisers wish to express sincere thanks to all who came in such huge numbers to support their event. It is just days away when the young dancing group Cosa Beoga, who have been hitting the country by storm, take part in the hugely popular RTE I All Ireland Talent Show when they represent the West on this Sunday night at 6.30 pm. Cosa Beoga, who are based in Abbeyknockmoy feature three young dancers from the parish, Adam and Lauren Hession of Ballybrone and Robert Carr of Waterview. The children of Brian and Marie Hession and John and Margo Carr have already featured on the popular Jig Gig on TG4 and are now all set to take part on RTE’s All Ireland Talent Show. People from the area are encouraged to give them a vote and help them represent the west in the next round. The group have been canvassing for votes on that contest and ask people to tell their friends to support them on the night. The people of the area wish them well.